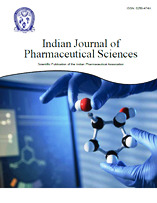 Stability-indicating reversed-phase high-performance liquid chromatography method was developed and validated for the simultaneous estimation of ezetimibe and glimepiride. Chromatographic separation was achieved with a Shimadzu’s high performance liquid chromatograph and PhenomenexL1 analytical C18 column with a mobile phase of acetonitrile:ammonium acetate buffer (30 mM):methanol (50:45:5 %, v/v/v). The flow rate was set at 1.5 ml/min and the detection wavelength was 232 nm. Quality by design approach was employed for optimization of method parameters like proportion of mobile phase, concentration of buffer and a model highlighting the design space was generated. This developed chromatographic method gave well resolved symmetric peaks. Ezetimibe and glimepiride were eluted at 6.7 and 4.4 min, respectively. This method was validated according to ICH Q2(R1) guideline. The method was linear in range of 50-400 µg/ml for ezetimibe and 5-40 µg/ml for glimepiride with r2=0.9999 and 0.9996, respectively. The sample recoveries were in good agreement with the respective label claim, which suggested non-interference from formulation additives in the estimation. Forced degradation studies were carried out and the stressed samples were analysed using the developed method.